Waste Management, Inc. (NYSE:WM) and Advanced Disposal Services, Inc. (NYSE:ADSW) announced today that they have entered into a definitive agreement under which a subsidiary of Waste Management will acquire all outstanding shares of Advanced Disposal for $33.15 per share in cash, representing a total enterprise value of $4.9 billion when including approximately $1.9 billion of Advanced Disposal's net debt. The per share price represents a premium of 22.1% to Advanced Disposal's closing share price as of April 12, 2019, the last trading day prior to today's announcement, and a premium of 20.9% to Advanced Disposal's 30-day volume weighted average price as of the same date. Waste Management is North America's premier environmental solutions company. This acquisition grows Waste Management's footprint and allows Waste Management to deliver to Advanced Disposal customers unparalleled access to differentiated, sustainable waste management and recycling services. With 2018 revenues of $1.56 billion, adjusted EBITDA of $427 million and approximately 6,000 employees, Advanced Disposal serves more than 3 million residential, commercial, and industrial customers, including over 800 municipalities primarily in 16 states in the Eastern half of the United States. Advanced Disposal's solid waste network includes 94 collection operations, 73 transfer stations, 41 landfills, and 22 owned or operated recycling facilities. "At Waste Management, we focus on creating value for all stakeholders, delivering on our commitments to employees, customers, community partners, shareholders and the environment. The acquisition of Advanced Disposal extends these commitments by adding complementary assets and operations as well as a team with a shared focus on safety, outstanding service and operational excellence," said Jim Fish, President and Chief Executive Officer of Waste Management. "With this acquisition, we will grow our asset footprint to serve more customers and communities and generate significant growth and value creation opportunities for Waste Management's shareholders and our combined company's employee base. 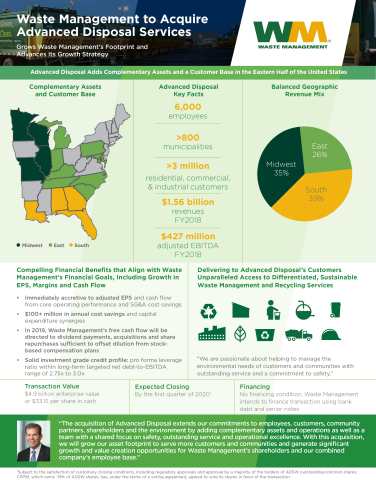 Waste Management's disciplined capital allocation and balance sheet strength position us well to execute upon this unique opportunity to expand our scale and capabilities to serve an even broader customer base and realize the strategic and financial benefits the acquisition of Advanced Disposal creates." "We are pleased to have reached this milestone agreement with Waste Management to deliver an immediate cash premium to Advanced Disposal stockholders. We view Waste Management as an industry leader with one of the most respected brands in the nation," said Richard Burke, Chief Executive Officer of Advanced Disposal. "This acquisition stands as a testament to the strength of the Advanced Disposal business and brings together two strong waste management teams with extensive environmental services expertise to better serve our customers and communities. We look forward to working with the Waste Management team to complete the transaction and ensure that we continue to deliver the highest quality service to our customers." Expand Waste Management's Footprint and Customer Base. This acquisition brings a high-quality, complementary asset network and customer base under Waste Management's proven management team, who has a track record of operational excellence and a demonstrated ability to grow the margins and cash flows of the assets Waste Management has acquired. Create Significant Synergies and Grow Waste Management's Earnings and Cash Flows. Waste Management expects the transaction to generate more than $100 million in annual cost and capital expenditure synergies. The Advanced Disposal acquisition will be immediately accretive to Waste Management's adjusted earnings per share and cash flow, with near-term benefits expected from core operating performance and SG&A cost savings. Incremental benefits from operating and capital efficiencies and network optimization will drive long-term margin expansion and improved free cash flow conversion. Support Waste Management's Capital Allocation Priorities. Waste Management's strong balance sheet and significant free cash flow generation position it well to fund the acquisition. In 2019, Waste Management's free cash flow will be directed to dividend payments, acquisitions and share repurchases sufficient to offset dilution from stock-based compensation plans. The Advanced Disposal acquisition will enhance Waste Management's cash flow growth and support its commitment to grow shareholder returns. Waste Management currently expects to achieve targeted leverage and return to normal run-rate share repurchases within one year of the acquisition's close. Following completion of the transaction, Waste Management expects to maintain a strong balance sheet and solid investment grade credit profile with a pro forma leverage ratio within the Company's long-term targeted net debt-to-EBITDA range of 2.75x to 3.0x. The transaction, which was unanimously approved by the boards of directors of both companies, is expected to close by the first quarter of 2020, subject to the satisfaction of customary closing conditions, including regulatory approvals and approval by a majority of the holders of Advanced Disposal's outstanding common shares. As previously announced, Waste Management will release its first quarter 2019 financial results before the opening of the market on Thursday, April 25, and will hold a conference call at 10 a.m. ET. On the call, Waste Management's management team will also discuss the Advanced Disposal acquisition announcement. Centerview Partners LLC is serving as exclusive financial advisor to Waste Management, and Simpson Thacher & Bartlett LLP and Vedder Price P.C. are serving as Waste Management's legal counsel. UBS Investment Bank is serving as exclusive financial advisor to Advanced Disposal, and Shearman & Sterling LLP and Mayer Brown LLP are serving as Advanced Disposal's legal counsel. Waste Management, based in Houston, Texas, is the leading provider of comprehensive waste management environmental services in North America. Through its subsidiaries, Waste Management provides collection, transfer, disposal services, and recycling and resource recovery. It is also a leading developer, operator and owner of landfill gas-to-energy facilities in the United States. Waste Management's customers include residential, commercial, industrial, and municipal customers throughout North America. To learn more information about Waste Management, visit www.wm.com or www.thinkgreen.com. This press release contains "forward-looking statements" within the meaning of the U.S. federal securities laws about Waste Management, Advanced Disposal and the proposed acquisition, including but not limited to all statements about the timing and approvals of the proposed acquisition; ability to consummate and finance the acquisition; integration of the acquisition; future operations; future capital allocation; future business and financial performance of Waste Management and Advanced Disposal and the ability to achieve full year financial guidance; future leverage ratio; and all outcomes of the proposed acquisition, including synergies, cost savings, and impact on earnings, cash flow and margin, return on capital, strength of the balance sheet and credit ratings, which are made pursuant to the safe harbor provisions of the Private Securities Litigation Reform Act of 1995. Words such as "expect," "likely," "outlook," "forecast," "preliminary," "would," "could," "should," "can," "will," "project," "intend," "plan," "goal," "guidance," "target," "continue," "sustain, " "synergy," "on track," "believe," "seek," "estimate," "anticipate," "may," "possible," "assume," and variations of such words and similar expressions are intended to identify such forward-looking statements. You should view these statements with caution and should not place undue reliance on such statements. They are based on the facts and circumstances known to Waste Management and Advanced Disposal (as the case may be) as of the date the statements are made. These forward-looking statements are subject to risks and uncertainties that could cause actual results to be materially different from those set forth in such forward-looking statements, including but not limited to, general economic and capital markets conditions; the effects that the announcement or pendency of the merger may have on Waste Management, Advanced Disposal and their respective business; inability to obtain required regulatory or government approvals or to obtain such approvals on satisfactory conditions; inability to obtain stockholder approval or satisfy other closing conditions; inability to obtain financing; the occurrence of any event, change or other circumstance that could give rise to the termination of the definitive agreement; the effects that any termination of the definitive agreement may have on Advanced Disposal or its business; legal proceedings that may be instituted related to the proposed acquisition; unexpected costs, charges or expenses; failure to successfully integrate the acquisition, realize anticipated synergies or obtain the results anticipated; and other risks and uncertainties described in Waste Management's and Advanced Disposal's filings with the SEC, including Part I, Item 1A of each company's most recently filed Annual Report on Form 10-K, which are incorporated herein by reference, and in other documents that Waste Management or Advanced Disposal file or furnish with the SEC. Except to the extent required by law, neither Waste Management nor Advanced Disposal assume any obligation to update any forward-looking statement, including financial estimates and forecasts, whether as a result of future events, circumstances or developments or otherwise. 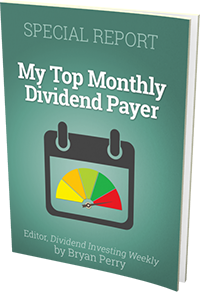 Advanced Disposal's 2018 adjusted EBITDA is a non-GAAP measure. Please see Advanced Disposal's press release and accompanying tables dated February 21, 2019, filed with the SEC on Form 8-K, for additional information about Advanced Disposal's use of non-GAAP measures and a reconciliation of 2018 adjusted EBITDA to net income, the most comparable GAAP measure. Waste Management's references to future adjusted earnings per diluted share and free cash flow are non-GAAP measures. Please see the notes to Waste Management's press release dated February 14, 2019, filed with the SEC on Form 8-K, for additional information about Waste Management's use of non-GAAP measures. For purposes of the pro forma leverage ratio, all terms used in that calculation, including EBITDA, are defined in Waste Management's Revolving Credit Agreement filed with the SEC on Form 8-K on June 29, 2018. This communication does not constitute an offer to sell or the solicitation of an offer to buy any securities or a solicitation of any vote or approval. This communication may be deemed to be solicitation material in respect of the proposed merger between a subsidiary of Waste Management and Advanced Disposal. Advanced Disposal intends to file with the SEC a proxy statement in connection with the contemplated transaction. The definitive proxy statement will be sent or given to Advanced Disposal stockholders and will contain important information about the contemplated transaction. INVESTORS AND SECURITY HOLDERS ARE URGED TO READ CAREFULLY AND IN THEIR ENTIRETY THE PROXY STATEMENT AND ANY OTHER RELEVANT DOCUMENTS FILED WITH THE SEC WHEN THEY BECOME AVAILABLE. Investors and security holders may obtain a free copy of the proxy statement (when it is available) and other documents filed with the SEC at the SEC's website at www.sec.gov, or without charge, by contacting Advanced Disposal's Investor Relations at investorrelations@advanceddisposal.com or (904) 737-7900 or Waste Management's Investor Relations at eegl@wm.com or (713) 265-1656. Advanced Disposal and its directors and executive officers may be deemed to be participants in the solicitation of proxies from Advanced Disposal stockholders in connection with the contemplated transaction. Information about Advanced Disposal's directors and executive officers is set forth in its proxy statement for its 2019 Annual Meeting of Stockholders, which may be obtained for free at the SEC's website at www.sec.gov. Additional information regarding the interests of participants in the solicitation of proxies in connection with the contemplated transactions will be included in the proxy statement that Advanced Disposal intends to file with the SEC.